How often can you sing along with a musical, when you’re seeing the musical for the first time? Not very. But in Julie Taymor’s Across the Universe, you can sing along with the Beatles-inspired characters as they sing many of our favorite songs, traveling through the American landscape that was the 1960’s. The film is set in the backdrop of the 1960’s, and according to my Dad, who was a teenager when all this went on, nails the feeling of it. Being 14, I of course wasn’t alive during this time, but I could tell it felt accurate because of how real and down to earth it was done. Many parts of the movie are quite powerful, mostly because of how well they use the songs. There’s really not much more to say. My only complaint is that the movie does drag a bit in the middle, but the finale is so good you can easily forgive it. 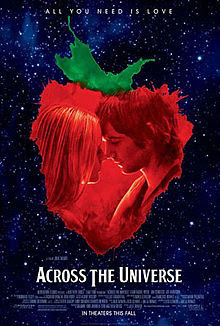 Across the Universe is definitely one of the best films of the year, and has my high recommendation.